Apex Carport 4m x 6m (13'1 x 19'7) Double Car Port 16'4" x 19'7"
The Carport Prestige unlike some of the other car ports on the market have been built with no fixings but with glue so there will not be any rusting on the building. The Stable planks used in this building will have an approximate diameter of 12cm. It has been made with prefabricated wooden parts so that installation has made easier. The roof boards on the car port are 19mm thick. 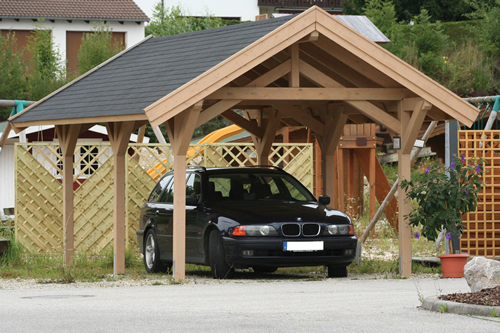 Car Port Options Along with all the unique options this car port offers as standard, there are also extra options you may be interested in; Dual pitch roof, pent roof or flat roof, wall elements between the pillars as well as different sizes for gates. For any of these options or something we don't mention that you would like please contact us for prices. It comes untreated but can be bought to life if painted. Supplied with no roofing material. 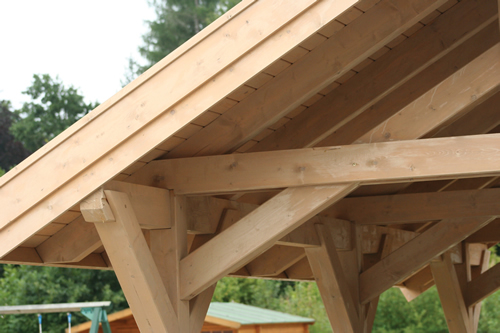 Shingles can be chosen below to enhance the shed. Carport Prestige Dimensions Outside Dimension: 304cm (10') x 516cm (16'9) Roof Projection: all around 30cm (11inches) Side Wall Height: 220cm (7'2") Ridge Height: 320cm (10'4") Roof Area: 31,50m square Slope: 30 Degrees Delivery is FREE to most locations in the UK however there may be additional charges for Scotland, Wales and parts of Cornwall. Please contact us for prices before ordering. The Handy Garden Roller removes bumps to create a smooth and professional looking lawn.